Have you seen NIGHT OF THE LIVING DEAD 3D: RE-ANIMATION ? Has anyone seen this film? 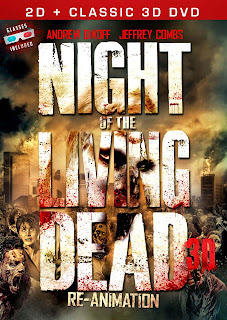 NIGHT OF THE LIVING DEAD 3D: RE-ANIMATION just came out about 2 weeks ago on DVD. I had seen the first trailer, but just saw the second trailer for the film tonight. The second trailer actually shows footage with star Jeffrey Combs (of RE-ANIMATOR fame) and the film looks like it could be pretty good...let me know if you have seen this film. I would like to hear some thoughts on it before tracking it down to watch for myself. 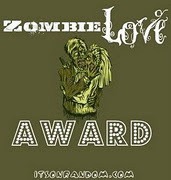 I love a good zombie film, and have always been a fan of Combs, so hopefully this will be one worth watching. Leave a comment if you have seen the film and let me know what you think. Watch the new EVIL DEAD Red Band trailer! Just last week I posted the leaked trailer for the EVIL DEAD remake that was shown at the New York Comic Con. It was recorded by someone in the theater, so the quality was not good. Well, the trailer has been officially released, so now we can watch this better quality version of the trailer. It's the same trailer, but a clearer version and let's face it...this trailer is good enough to watch again and again. I can't tell you how excited I am to see this film! I think this will be a cool experience to witness an EVIL DEAD film in the theater, something I have never got to do. I know some people are worried that this film is going to not be any good, but I don't see how that is possible by the looks of this trailer. Also, the film is produced by Bruce Campbell, Sam Raimi, and Robert G. Tapert (the creators of the original film), so I have faith that these guys will not let an inferior product hit the theaters. 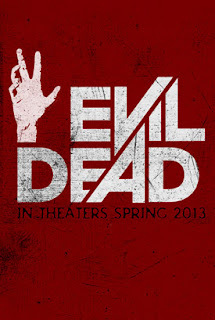 The EVIL DEAD remake has a set release date of April 12, 2013. I have to start by admitting I have never seen any of the WRONG TURN sequels. I saw the first WRONG TURN and absolutely loved it! I thought it was a fun premise and had some great effects in terms of the kills. I always meant to watch WRONG TURN 2, but just never got around to it yet. Then, part 3 came out, and before I knew it, there was a part 4, and now we have WRONG TURN 5: BLOODLINES! The good news is you do not have to see the other films to enjoy this one. I think these films are starting to be like the FINAL DESTINATION films, where there ares some basic key elements that continue from film to film, but basically each film is a stand-alone film. This was a very fun film and is worthy of your time (and $$). While the gore is great (and I will discuss that more in a bit), the highlight of this film for me was the presence of veteran horror actor Doug Bradley. You know him best as Pinhead from the HELLRAISER films. That is really all I had ever seen him in, but hopefully he will do more stuff now that he is done playing the Pinhead character. Bradley is a very good actor and was very fun to watch in this film. He plays the lead villain, and is sort of the Father figure to the group of backwoods, inbred hillbillies that terrorize the group of visiting college kids. He has some great lines and delivers them wonderfully. I couldn't help but smile when he referred to someone in the film as a "Pinhead"! Ha! The film almost plays out like one of the FINAL DESTINATION films, where the focus is on killing off each character in very bizarre and gruesome ways. Like I mentioned before, the gore is incredible in this film and the kills are great, including a crazy scene involving a farm tractor...you see this eluded to in the trailer. Check out the teaser trailer for the new CARRIE remake! I am a big fan of the original CARRIE (1976), based on the Stephen King novel of the same name. The movie was remade in 1988 and again in 2002. You would think that would be enough remakes of this film, but a 3rd remake is due out in 2013 starring Chloë Grace Moretz in the title role, and Julianne Moore as Carrie's Mom. I have to admit I wasn't too excited about this film until I just saw the teaser trailer a few minutes ago. I don't think what is shown is actual film footage, but just shot to make this promo teaser. This teaser is pretty darn cool, though, and from the feel of this teaser, I think this is going to be a much darker version of CARRIE than we have seen before, something I didn't think was even possible. 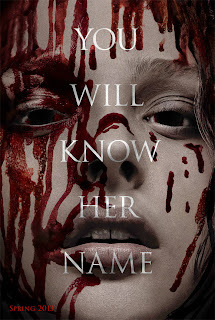 Moretz looks great as Carrie and she has really turned into quite a good actress, so I am expecting big things from her. Check out the teaser and let me know what you think! Apprehensive Films has recently released a must have DVD for any fans of Halloween, and who of us horror fans is not a fan of Halloween?! 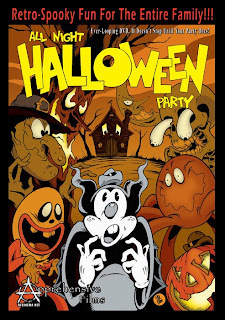 ALL NIGHT HALLOWEEN PARTY is a great DVD perfect to play at your upcoming Halloween Party, or really any time of the year in my opinion! I love the fact that this DVD is an ever-looping DVD, meaning it will play over and over again on your DVD player until you manually stop it. That makes it perfect for putting on and playing at your Halloween party for some great background ambiance, although I bet it will begin to become the center of attention at the party as your guests start noticing it and watching it. This doesn't just have to be for a party, though. I watched it the other night by myself and enjoyed it thoroughly. I love the old school animation (cartoons on this DVD are from as far back as the 1930's!) and I also love the fact that they have put a trailer for a "classic" horror film between each cartoon. I love movie trailers, especially for films of movies I have never seen, or in this case even heard of. Along with trailers for films we all know like THE HOUSE ON HAUNTED HILL, there are trailers for films I knew nothing about, such as the King Kong rip off KONGA and the looks-so-bad-I-bet-it-is-amazing creature feature called REPTILICUS! This DVD is a lot of fun. I highly recommend this one. I recently got a press release about a short horror/comedy film called NIGHT OF THE PUNKS. The film is currently available to watch for FREE on Youtube and on the film's official website! Small town punk rockers THE BRAIN DEADS have their first out of town show, but there are a few problems: The venue is deserted, the promoter is a creep, their bassist has gone missing, and the only kids in the audience turn out to be bloodthirsty punk rockers from Hell. NOTP is a splatterpunk love letter to 1980's horror cinema, heavily influenced by films like Return of the Living Dead, The Evil Dead and Night of the Demons. NIGHT OF THE PUNKS is a lot of fun. The plot is simple and the film is shot very well. The acting is superb by everyone involved and the demon and creature effects are very well done. The film is shot in a style of film from the 80's, and it really has that feel to it. The film also mixes the comedy and horror perfectly. 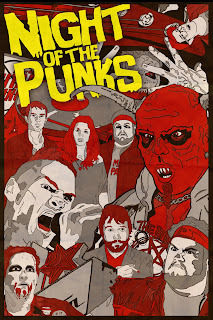 A lot of horror/comedy films are more comedy than anything, but NIGHT OF THE PUNKS balances it perfectly. This is a great film and I look forward to future projects from Mr. Riesser and all the filmmakers involved with this production. The film is only about 20 minutes long, so check it out when you have a few minutes. Director Dan Riesser says that a feature length version of the film is in the works! I will pass on more details about that as they become available, or, keep checking the films official website for updates. Have you seen the trailer to the EVIL DEAD remake? If you haven't seen it yet, the trailer for the remake of EVIL DEAD has been leaked onto the internet. The trailer was premiered at the New York Comic Con and I can't tell you how excited I am to see this movie. The great folks over at JoBlo.com have posted the trailer on their website. At first, the trailer looks just so - so....like your typical teen horror film, but stay with it, as it gets crazy as it goes on. This looks like a much darker, more true horror film than the original from what I can see from this trailer. This should be an interesting take on the classic film we all know and love. I personally can't wait to see this film. Watch the trailer and let me know what you think by leaving a comment below! It's [almost] time for another giveaway!! Hello fright fans!! I got a box of goodies just waiting to give out to some lucky contest winners! 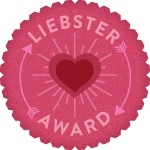 I haven't done a contest in a while, so I am thinking I need to do one soon! 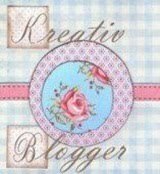 So, here's the deal...The 4H blog has 395 blog followers as of this posting. As soon as we get 400 followers, we will announce our next big giveaway!! 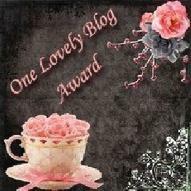 That's right, just 5 more followers of the 4H blog and it will be giveaway time!! Tell your friends! 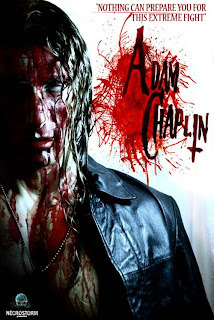 I'm not sure how I came across ADAM CHAPLIN, but I knew nothing about this film going into it and I really haven't heard much about this film. This surprises me, because this is a film I would think more people would be talking about. I see "cult classic" all over this film! Set in the fictional country of Heaven Valley, the film is the story of a man, Adam, who following the suspicious death of his wife begins to investigate her murder and in doing so, discovers the involvement of local mafia boss: Denny Richards.Unable to trust the police, corrupt and controlled by Denny, Adam, consumed by anger, summons a demon who offers him superhuman strength and dark powers. The demon follows him during his trip, promising to lead Adam to the door of the murderer if he does everything the demon asks. This unleashes a bloody war that will bring Adam, the demon on his side, against the police department with all its dark allies. The fight begins and it will be extreme! A lot of films claim to be "The Most Bloody Movie Ever Made", as this film does on the cover of it's DVD, but this is one of the few that could actually take that title. Saying the film is bloody is an understatement. This film is extremely bloody and violent, with crazy gore that has to be seen to be believed. I guarantee you have not seen anything like this before. Gore and violence that you would think could only be drawn on the pages of a graphic novel come to life on screen. While I was watching it I remember thinking that it was as if I was watching a live action comic book. Now I do have to admit, the plot was a little confusing and unclear at times, but you don't watch this movie for the story line. This film is all about the violence and gore and it delivers that on many levels. I kinda liken this film to Peter Jackson's BAD TASTE. That film is not that great story wise, but that film is a fan fave among horror fans for the over the top effects. ADAM CHAPLIN, to me, should be in this same category of film. This is the film film for writer and director Emanuele De Santi according to his imdb.com page, so for this being a first film for a director, I would say Mr. De Santi has hit a home run in his first up to bat! I can't imagine the great films that are in store for us if De Santi keeps on making horror films! 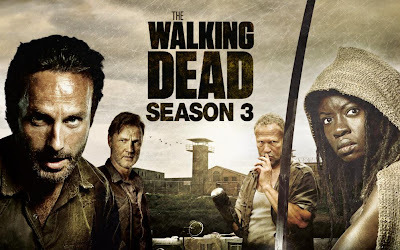 That's right....the premiere of THE WALKING DEAD Season 3 is finally here!! Tonight at 8pm Central time on AMC. Now I know I don't have to tell any of you that...if you are like me you have your calendars marked and have been waiting on this day for months! But, it is still exciting news and I couldn't think of posting anything else that was better news than this. It is going to be hard to top last season, especially with the Sophia story line and reveal...but I know the makers of this show won't let us down, and from what I hear, the first episode tonight is filled with bloody zombie carnage as Rick and the gang try to take the prison for themselves. It should be a great night of zombie mayhem!! If you are in Las Vegas, be sure to visit Eli Roth's GORETORIUM! 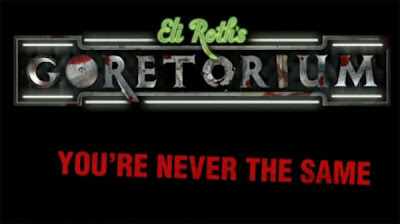 For those of you in the Las Vegas area, or those planning a trip to Vegas anytime soon, you might want to do yourself a favor and head over to Eli Roth's GORETORIUM! The Goretorium is a year round haunted house on the Vegas strip. If there is one thing Eli Roth knows, it is horror and gore, and I suspect that the Goretorium will have plenty of both. I can't imagine what this attraction will be like. It is open now and I hope to make it out there someday. Check out the website by clicking the link below or click the pick above. The website is great with tons of great pics and videos about the Goretorium. The website also has a section where you can watch a web cam of people going through the Goretorium, although at the time of this writing, the web cam was not working. I will keep checking back to see if it back online, because I think that would be a very fun web cam to watch! If you have been to the Goretorium, please leave a comment and let us know your thoughts on it! CLICK HERE to visit Eli Roth's GORETORIUM website! The Japanese are known for some of their crazy video games, but this one is a little too far fetched. 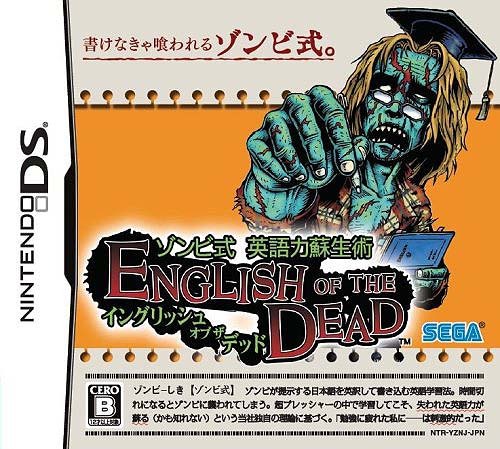 In order to teach kids English, they took the HOUSE OF THE DEAD 2 game and changed it into a learning tool! They did this by taking away your gun and making you spell words to kill the zombies!! 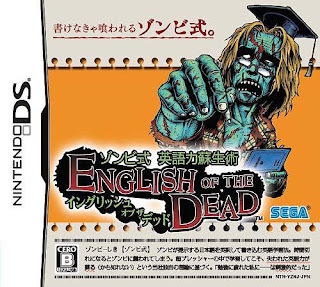 The game challenges players to correctly translate words into English from Japanese in order to kill the zombies. Other modes include zombies that speak English out loud, where players must translate what they're saying. I'm not sure how well this worked, but it's pretty amusing to me. I assume this was only available overseas, as I doubt kids here in the U.S. would buy into this concept. Click the link below to see some actual game play. 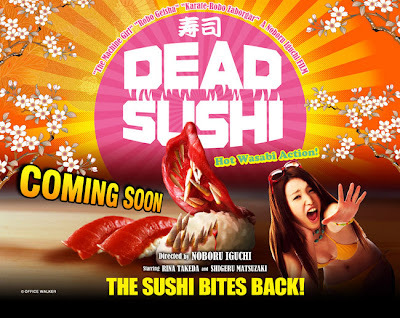 Just when I thought Japanese horror films couldn't get any crazier, along comes DEAD SUSHI! As silly as this premise sounds, I think it will be a really fun film. Definitely not one to take seriously on any level, but one to just watch and have fun with. Will you be seeing PARANORMAL ACTIVITY 4? It's hard to believe that a small, low-budget film like 2007's PARANORMAL ACTIVITY could launch such a successful franchise, but here we are 5 years later and just around the corner is the release of PARANORMAL ACTIVITY 4! I am a big fan of the PA films...I have enjoyed them all, although I did think the last one (Part 3) got a little silly with the coven of witches sub-plot. It looks like PA4 is back to the roots of what makes these films so great. Click below to watch the trailer if you haven't seen it yet. PARANORMAL ACTIVITY 4 is set for release this coming October 19th! Will you be seeing this one in the theater? I know I will, as I don't think this movies work as well on small TV's at home. I think these are films you definitely need the dark theater aspect to really enjoy. This is by far one of my favorite horror movie sequels of all time. I love the character of Leatherface, so it was awesome getting to see him again in a new film. As I stated before, I hadn't seen this movie in years, so it was almost like watching it again for the first time. There are tons of great things about this film, including the great performances by Dennis Hopper, Caroline Williams, and Bill Moseley. Moseley's character of "Chop-Top" is especially memorable, Chop-Top is a character you will not soon forget after seeing him. The make up effects and gore are also great in this film, probably because of the presence of Tom Savini. He bring some great gore gags to the film, including a great sawed in half head scene. 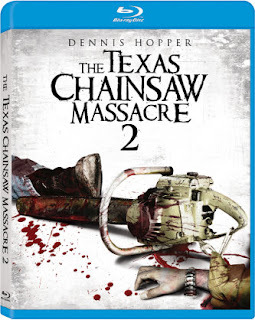 THE TEXAS CHAINSAW MASSACRE 2 also holds the award for best "jump-scare" of any film ever made. I won't say too much about it in case you haven't seen the film, but it is such a good scene, I actually hit rewind and watched it a couple more times. Rob Zombie's THE LORDS OF SALEM trailer is finally here!!! It seem like we have been waiting forever for a glimpse at some actual footage from director Rob Zombie's upcoming film, LORDS OF SALEM. The wait is over as a teaser trailer has been released!! 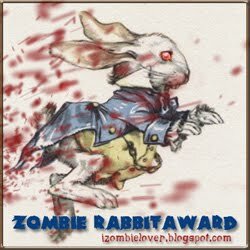 I am a huge fan of Zombie's films, and this one looks like it will be an instant classic. I have hear people talking about how it has a Stanley Kubrick feel and look to it. I can definitely see that, but I also think it has more of a Dario Argento feel to it...especially with the use of color. Also, the 3 witches at the end remind me of Argento's film, SUSPIRIA. Check out the trailer now if you haven't already. Let me know what you think by leaving a comment below. LORDS OF SALEM will be released to theaters sometime next year. Watch the trailer and let me know what you think. You can also pre-order the DVD or Blu-ray using the links below. 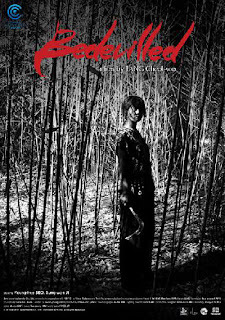 BEDEVILLED will be released on DVD and Blu-ray on October 9th, from Well Go USA.